The internet is a very effective tool. Connecting, sharing, work, social interactions – all can and do happen in a mere instant. I am in contact with family and friends from all parts of my life. I can learn news, see pictures, and engage in my Quaker and other communities more easily from a distance. I can share inspirations, make connections, and be invited to in-person visits and conversations. And yet…. the barrage of immediate interruptions, questions and comments vying for my attention, beeping and blurping all day long without end can be exhausting. In my case, some of my daily work involves monitoring of social media accounts – it is often hard to disengage. I use these tools for important communication – and sorting the content into usefulness (or lack thereof!) can become troublesome. How do I approach this dilemma? Here’s a few strategies that have worked for me. Friends: I have about 2000 Facebook friends. If I saw all their posts, every day, in my news feed, it would be overwhelming. You can “unfollow” individual people. You remain friends with them, and connected, but their news won’t pop up on your screen. I have about 20 friends and family who I “follow” – their information shows up on my account when they post. Once a week or so, I’ll sit down intentionally and scroll through my list of friends, and click on their accounts and see what is happening with them. Maybe one week it’s family, one week it’s folks from high school and college. I love to be in touch with folks through Facebook. These are people might not have time to call more than one a month or so – and the contact on social media allows me to hear some of their news and see their pictures between in-person contact. Also – create private groups for internal conversations. Groups of ministers, travelers, parents, family. All can be helpful to cut down on the general “noise”. Events: My current schedule often allows me to attend events in my local area – in many categories. Social witness, family and kids events, art talks and films. If I see something that interests me in my news feed, I click on “interested” and move on. In an intentional space, with my calendar open, I’ll go back and look at all the events I’d marked, and decide if I want to attend. Than I put all the info in my calendar. The point here is I am not stopping each time I see an event to change my focus and think about it. Facebook also now has a separate “events” app – I can go there once week or so and check events by theme, or in my local area. I intentionally sit down and do this, with my calendar, twice a week, instead of always stopping every time i see an event pop up. Pages: I have a large amount of varied interests. I use to just like every page. These days, I mostly “like” Quaker pages, and pages of my friends’ organizations. I pick ten or so to follow (they show up in my news feed) – and the rest I can check once in a while, at my choice. You can also select a “show first” page and you will see that page every time it posts! If you are an admin for a page – ask your followers to follow your page in this way! My phone access: Yes, I have a smart phone. Sometimes folks will say we are “always on our phones” – and I agree. However, the phone has allowed me to not have to open a computer for days at a time. I have apps that allow me to read google docs, get alerts for messages, all the things I might do on a computer. But what if it is a 24/7 distraction in my pocket? When I am going to be away (weekend, vacation, intentional time) I set away messages on email – and delete my phone apps. The accounts are still active and there, but the time it would take me to upload the app again is never worth it. My close friends and family all can text or call me. I also have a very clean iPhone display – all my apps are in folders and categories, it helps me to not start mindlessly flipping through apps to see what’s going o in the world. I’m IN the world. I can also look up! Develop personal rules: These are specific to you. A few of mine…. Never respond to an angry message from my phone. Always open a computer, sit down intentionally, and if possible wait 24 hours. ON social media – this might be a shorter time frame, but still, not until I can sit and center and not speak out of anger. Let my phone messages (voice/text) go to voicemail if I am not in a place where I can talk. Shut off phone notifications. I can check a few times a day. If there is a post on Facebook I suspect might be controversial, I can leave notifications on for that post. Have you noticed that when you comment on a post, you then get updates when others have also commented all day long? Hundreds of posts? If you do not want to get those notifications, just select “turn off notifications for this post”. You can go back later and read the whole page when/if you have time/interest. Use drive time efficiently. I travel a lot! It’s great time to catch up on podcasts, and make a few quick hands-free check in brief calls. This is not when I am driving with others, especially my kid who wants to talk to me! #latergram: Post pictures later. When I travel in ministry, I love to take a few photos to use later in blog posts. When I get home I’ll upload them to a blog post, or Canva if I’ll use them in a YM promotion. I’ll go back later in the week and intentionally create the posts and write the article about my visit. I do always try to “check in” in real-time when I am at a meeting or event – but that is enough. Have a plan: When I am attending a witness or event where live broadcasting or pictures might be helpful – I intentionally plan to be on my phone. I have recently been broadcasting live on the Quakers Concerned with Immigration Justice page for example – and that I consider my first priority – to share the news with those who cannot be there. I don’t also do other things while at a witness. I designate myself a “social media” person and that is the job. Don’t be afraid to “unfriend” or “block” or unfollow a page if it seems wise. Just because you are not in the Quaker peace FB group does NOT mean you are not a Quaker who wants peace. Many FB groups can be filled with argumentative folks who have trouble listening to others, or are so insistent and passionate they dominate the group. You don’t have to participate. Be kind, but clear. Also on your own Facebook page and other social media accounts – if conversations become heated or demeaning to others, remind folks that they are on your page. I call it my “digital living room”. I make the rules – and any heated conversation can be moved to a FB group or another person’s page. I do not allow hate speech, etc. If you manage an account for your Meeting, you can’t really only log in once in a while. Social interaction happens at all times. The YM account that I manage shares 2-3 Facebook posts a day (on average). A number of those posts are what are called “evergreen” posts – they are “learn more” links to our website, links to newsletter/website articles, posts of quaker quotations, things that are relevant regardless of timing. I sit down once every two weeks, in a time I have set aside, and schedule those posts. I also use that time to create two weeks of Quaker quotation graphics posts on Canva. Facebook allows you to either post in real-time, or schedule a post (not share – a new post) up to a month in advance. If I am aware we in the YM have had a major unexpected event or news item that might be more important than an evergreen post, I can go in and simply reschedule or delete the previously scheduled post to allow space for the time sensitive one. However – do NOT rely only on evergreen posts! 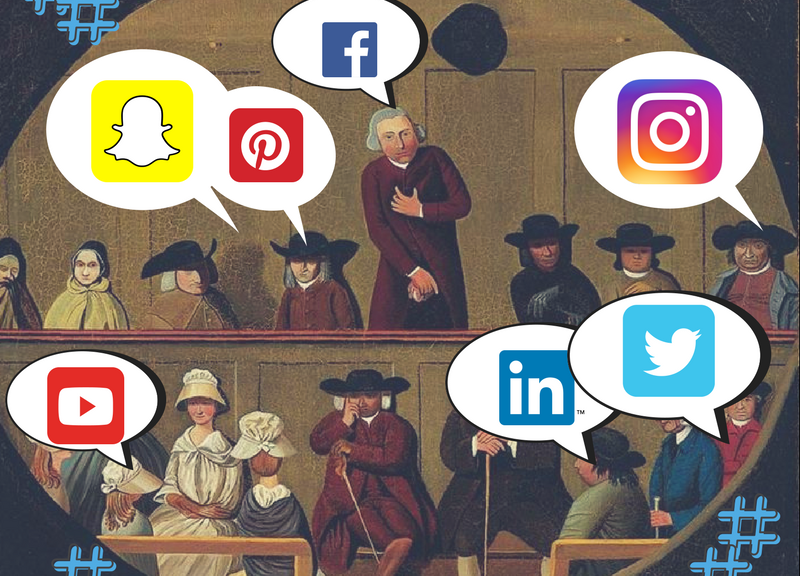 You want to make sure you are engaging with people looking at your page in the comments, sharing Quaker related news from other sources, and other news and events relevant to your audience in real-time. You may also want to use a scheduling program like Hootsuite or Buffer to do this posting. Those programs have had mixed results on Facebook – Facebook wants you to use its service, not another one, so it may decrease the organic reach of your posts that are posted by an outside service. In most of the account I manage now, I am the primary person posting. However, I know I cannot be available all the time (or want to be!). Have a tam that can help – it might just be a few Friends who watch the page and have permission to comment on posts, and delete questionable material. This of course is where your meeting’s discerned social media policy comes in handy! It is a guide to that work, so you don’t have to all talk every time a questionable concern arises. Be Intentional. Your time, your energy, is best stewarded by you and not another. Only you know what kind of limits and boundaries work in your life. This might look very different from other people’s shape of life. Be gentle with yourself. You will make mistakes. Social media can make them seem more public, more serious. They probably are not. Be kind, apologize when things go wrong, and wait before replying to a post when needed. Find support (Quakers are good at this). This might be a clearness process, an ongoing committee – treat the service to your meeting n social media as you would any other service. Clerks have supports. Finance committee, whomever. We all need support and a listening ear at times. Remember the digital world you see is not the world. This applies in person too. If you were to look at my social media feeds, you might think the whole world is fighting for peace and justice and black lives matter and everyone loves funny guinea pig videos. Unfortunately, this is not the case! social media is a curated platform support by advertising – they are showing you what you want to see. Get out and find the folks who see things differently! This is not just social media advice of course. Can you speak to all conditions? Is it required of you? Have you found other practices and advice helpful? Let me know in the comments! In which I consider deep controversy… and wonder why continuing revelation is so darn uncomfortable.